Lengths Available: 14" and 18"
CUTICLE DIRECTION - Cuticles in each strand of hair are aligned in the same direction. TANGLE FREE - Because the cuticles are in one direction the hair does not tangle and lasts longer than any other on the market. SHED FREE - Special sewing secures the weft and prevents it from shedding. VIRGIN REMI - Highest grade of human hair. Only 1 percent of the hair gathered is used for our Remi hair. Only the finest hand picked healthy virgin hair is used. 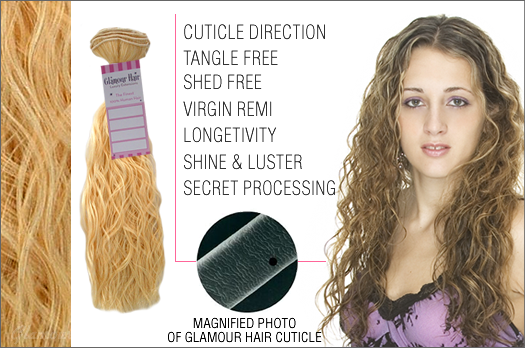 SHINE & LUSTER - Natural shine and luster is retained because of the cuticle direction. SECRET PROCESSING - Done by hand in small batches. No high heating ovens that dry the hair are used. All natural food grade ingredients are used and not harsh chemicals like acid. LONGEVITY – Lasts longer than any other hair because of the high quality.